I'm struggling to rate this book. There is a lot going on in the book. It does a good job presenting the reader with information and color on wealth and income in our history and present. It makes some predictions about what might happen in the future. 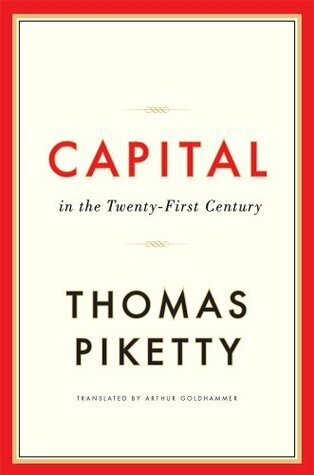 Some of topics you learn about in this book: taxes, capital, income, and literature. If you have been wanting to read this book but keep putting it off because of its size, I think you can skip to the last section and still gain something from this book. I liked the book. It has caused me to think differently. It has resulted in some good conversations with others. It also caused me to read less than normal, as I kept putting off picking up the book. Here are some other reviews which do a better job than I have reviewing this book. Sign into Goodreads to see if any of your friends have read Capital in the Twenty-First Century.